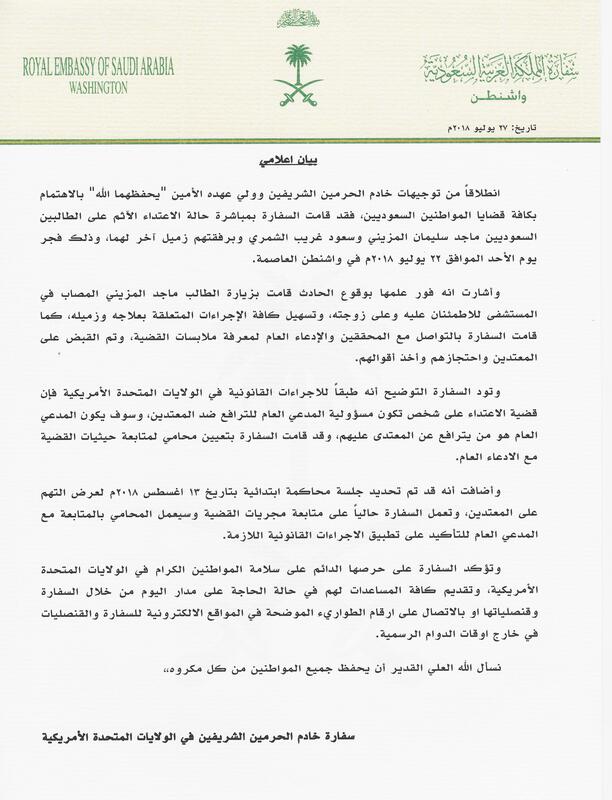 The Coalition Forces to Support the Legitimacy in Yemen’s Spokesperson, Colonel Turki Al-Maliki, issued a statement noting that at 1:15 AM, Riyadh local time, a Saudi oil tanker was the subject of a Iranian-backed Houthi militia attack while in international waters, west of the port of Hodeidah, which is under the control of the Houthi militia. The attempted attack was thwarted thanks to coalition naval vessels present in the area at the time. The attack resulted in minor damages to the tanker. The Custodian of the Two Holy Mosques King Salman bin Abdulaziz Al Saud has awarded two Saudi students posthumously with the Order of King Abdulaziz of the First Degree for their bravery and service. The two Saudi students drowned in the state of Massachusetts in the Chicopee River on June 29, 2018, while trying to rescue two children who were caught in the river’s current. The King met with the families of the two students at his office in the Salaam palace in Jeddah, where he expressed his condolences and sympathies for their loss, and lauded the student’s bravery and selfless act. The Embassy wanted to highlight a recent Op-Ed publication by His Royal Highness Ambassador Prince Khalid bin Salman, the Kingdom of Saudi Arabia’s Ambassador to the United States of America, in which he details why Iran’s detrimental expansionist policies across the Middle East and the rest of the world must not be appeased but rather confronted. Wednesday morning, July 18, 2018, Saudi Royal Air Defense Forces detected, at 10:15 AM local time, a ballistic missile fired towards the southwestern city of Najran, which was intercepted and destroyed. This reflects the second time this week that the Iranian-backed Houthi militia launched such an attack against the Kingdom of Saudi Arabia. The Custodian of the Two Holy Mosques King Salman bin Abdulaziz Al Saud received a delegation participating in the International Conference of Muslim Scholars Conference on Peace and Stability in Afghanistan, at the Al-Salam palace in Jeddah. On Sunday Evening, the Royal Saudi Air Defense Forces successfully intercepted and destroyed two Ballistic Missiles over Riyadh launched by the Iranian-backed Houthi Militias from the Yemeni province of Sa’dah. Spokesmen for the Coalition to Restore Legitimacy to Yemen Colonel Turki Al Malki confirmed that at 8:39 pm the RSDAF identified two ballistic missiles over Saudi airspace that were targeting civilian and residential areas. The missiles were destroyed over Saudi airspace, with the debris landing on residential neighborhoods. No casualties were cited. On Wednesday, June 20, MSCI Inc., an indexing platform, announced that, as of June 2019, it will include the Kingdom of Saudi Arabia in the MSCI Emerging Markets Index, the MSCI ACWI Index, and other applicable regional and international indexes. The decision is the outcome of culminated efforts by the Kingdom of Saudi Arabia’s relevant entities to implement a number of regulatory and operational improvements, including lower restrictions on international investors, the introduction of short-selling, and T+2 settlement time frames. The Custodian of the Two Holy Mosques, King Salman Bin Abdulaziz – may God preserve him - has followed with the utmost attention the truce reached during Eid Alfitr between the Afghan government and the Taliban Movement. He expressed his happiness, and support for this blessed step, and that he hopes for extending that truce and building on it for a longer period of time so that all parties can seek to achieve peace for the Afghan people.